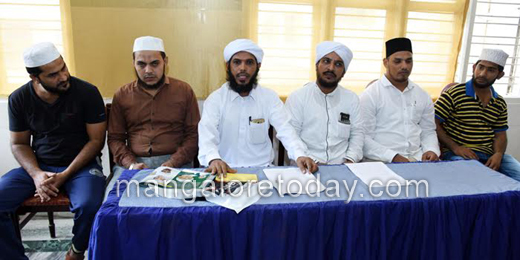 Mangluru, Jun 28, 2017: Shihabuddin Saqafi, director of Sayyed Madani Sunni Central Committee, Ullal alleges Confusion over celebration of Eid-ul-Fitr in Ullal was due to an assistant qazi of the dargah, who declared the festival without the consent of main qazi Assayyid Hamid Fazal Koyamma Tangal Madani Koorat of Ullal dargah . Speaking to reporters Saqafi said the dargah committee, which is supporting the assistant qazi, holds him equally responsible for the confusion. Ullal dargah was closed for namaz and other religious activities on Monday and the confusion was created by none other than the committee members. The qazi will announce the date of celebration of Eid-ul-Fitr. The decision of the qazi is final and no one else can decide or announce the date of celebration of Eid. Celebrating Eid on Sunday was against the decision of qazi Koora Tangal," he said. Due to confusion, 15 out of 26 mohallas coming under Ullal celebrated Eid on Monday and the rest on Sunday. Saqafi also said that" More than 2,000 people had gathered to offer Eid prayers but president of dargah and the committee members had locked the door which led to confusion.Celebrating Eid on different days is not wrong and people follow qazi of their mohallas. , but when people gathered to celebrate Eid, the main door of the dargah was locked.